Sensory play is incredibly beneficial to children because it encourages them to use all of their senses. Children learn in a variety of ways. Sometimes, they learn best in a classroom setting and need to be lectured by an adult in order to grasp a difficult concept. However, there are other times, where a child needs to rely on their senses to learn about the world around them. Children are naturally curious, and sensory play has a huge role in child development. With that said, here are three significant benefits of sensory play to children. The five humans senses include sight, smell, hearing, touch, and taste. Sensory play is incredibly beneficial to children because it encourages them to use all of their senses. It is important that children learn to utilize these senses because it will help them as they grow into teenagers. If a child is struggling with one of the senses, sensory play can help supplement any weakness. Children will learn through sensory play without even realizing it. Children are known to have excessive amounts of energy. Sensory play is an excellent way to get an anxious child to relax. As a parent, sometimes all you need to do to calm your child is put a fun toy in front of them and let them play with it. For example, if your child is very nervous about the trip to the doctor, a stress ball may help put them at ease. Generally speaking, sensory play primarily calls upon a child’s fine motor skills. 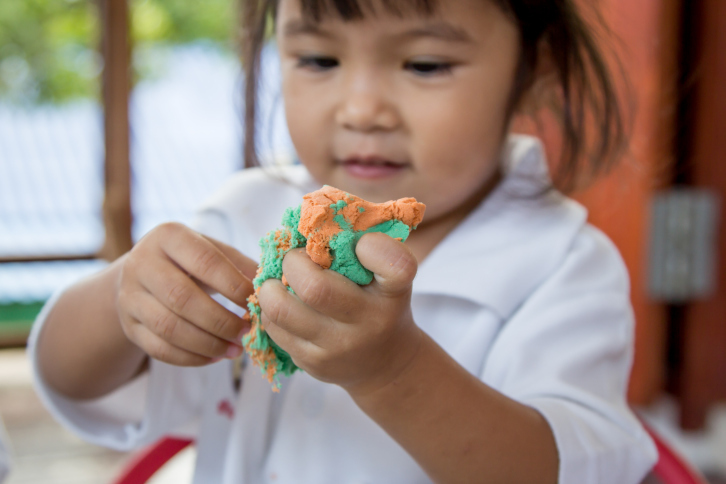 Fine motor skills are developed through activities that require the require of small muscle groups. A few examples of such include buttoning clothing, tying shoes, writing, and drawing. Sensory play is a great way for a child to develop the necessary motor skills children need. This entry was posted on Thursday, March 22nd, 2018	at 3:37 pm	. You can follow any responses to this entry through the RSS 2.0 feed. Both comments and pings are currently closed.